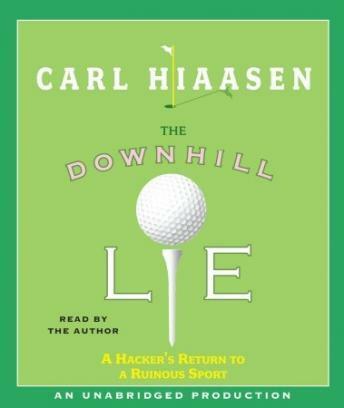 Originally drawn to the game by his father, Carl Hiaasen wisely quit golfing in 1973. But some ambitions refuse to die, and as the years–and memories of shanked 7-irons faded, it dawned on Carl that there might be one thing in life he could do better in middle age than he could as a youth. So gradually he ventured back to the dreaded driving range, this time as the father of a five-year-old son–and also as a grandfather. Hiaasen’s chronicle of his shaky return to this bedeviling pastime and the ensuing demolition of his self-esteem–culminating with the savage 45-hole tournament–will have you rolling with laughter. Yet the bittersweet memories of playing with his own father and the glow he feels when watching his own young son belt the ball down the fairway will also touch your heart. Forget Tiger, Phil and Ernie. If you want to understand the true lure of golf, turn to Carl Hiaasen, who offers an extraordinary audiobook for the ordinary hacker.